So what do Old Faithful and clapping have in common? Lemmings of course! I’d been hearing about Old Faithful for decades. We tried to visit it on our first trip to Yellowstone National Park but were turned back because of forest fires. So 25 years later we were finally walking up to the site. Considering this was the off-season, there were a surprising number of people sitting on benches laid out in a large semi-circle. Yet the crowd was strangely hushed. It felt odd – like a funeral without the sadness. I fiddled with my camera and waited quietly like everyone else. There was nothing else to do. Steam begins to rise from the geyser indicating something is about to happen. In time some hot steam started spewing out of the ground and an appreciative murmur rippled through the crowd. Old Faithful was soon shooting up a remarkable amount of water and steam, set to the accidental music of countless shutters clicking. One of them was mine. In time, the spray and the sound of shutters subsided. In the awkward silence that followed, someone started to clap and many others followed. I was bemused. People who make their life easy can happily clap just because everyone else is doing it. I need a better reason. Perfunctory clapping leaves me cold. I know a group session is heading straight for a reef when the leader exhorts everyone to, ‘give yourselves a hand.’ Yikes. I’m guessing the people all around me were clapping just because everyone else was. My faith in humanity took another hit. And someone else probably looked at me and wondered who stole my sense of spirit. I think I would make a lousy lemming. A lot of water gets shot up high into the air … and it’s hot. Pretentious encores – yes you definitely hit another pet peeve of mine. I’d much rather keep it real. As for your presentation, I’m betting you are underselling it. I completely agree with you about the clapping and the lemming mentality. On the other hand this a happy and spontaneous nation on the whole. Though the “mass hysteria” response can be embarrassing at times at least the Yanks aren’t a miserable bunch! Well that’s certainly true. It’s certainly better than jeering being the first response! Maybe people are anthropomorphizing the geyser especially since it has a name, “Old Faithful”. Possibly they believe that there is some very old man with a long white beard down below that is actually in charge of sending up the hot steam every day. So they feel they have to deliver respectful applause. If it was just referred to as… ‘some geyser that erupts periodically’ maybe it would not receive the accolades. I never thot of the old guy in the beard. Very good. And now it all makes perfect sense in a crazy sort of way. And it all starts with a name. Eesh. The only thing that makes me less happy than the Lemming Clap is the Lemming Standing Ovation. It’s when clapping-because-you-don’t-know-what-else-to-do just isn’t enough of a statement. Couldn’t agree with you more. Really, there should be other options to consider! I totally dislike perfunctory clapping and I really don’t see the point clapping when a natural event is taking place. This is quite weird for me. But I like your photos. Everyone commenting on this post seems to agree on the clapping. Glad you like the photos. Growing up in South Africa, people used to clap at the end of movies. Rocky got a standing ovation. When they installed a musical fountain at the local mall, people used to clap for that, too. Amusing. And here I thot this odd behaviour was limited to North America. How did it cross the ocean? Ha! “All together now, lets us demonstrate our appreciation for a display that would have occurred with or without our participation. Huzzah to the cold indifference of the universe!” Old Faithful doesn’t care, that is part of what I love about it. I was lucky enough to be in Yellowstone a few years back and getting to see an eruption about a minute after I walked up to it. It also strikes me as funny to imagine a group of people roaming Yellowstone wear shirts that say “I Am A Lousy Lemming”. And here I thot randomly clapping with the crowd changed everything:) You described it oh so well. Your imagined t-shirt group might draw a few interesting looks. I say Old Faithful back in the 60’s, and your pictures brought back memories while I was there. It really is remarkable how long it keeps working. Hard to fathom actually. I know exactly what you mean, Lyle. Same reason I’ve never understood why some people clap in theatres at the end of a movie either. The only thing worse than perfunctory clapping is the person who starts perfunctory clapping with…a slow clap. Grrr. Oh, and I’d buy the shirt too. Happy to hear I’m not alone on this clapping thing. I have been vastly outnumbered in the theatre too though thankfully been spared the slow clap rendition. The shirt needs to be made! My favorite more personal geyser experience is White Dome geyser in the Lower Geyser Basin. Beautiful pictures! I just checked on a photo of that place and realized we didn’t go there. It looks great. Me too. Not a lemming. Nice images though. Glad to have someone else on board. I wondered what happened other times. It really was an odd, awkward moment. It’s like people were unprepared and confused. I’m with you on the people thing, I’d much prefer to be alone. I might have to get the shirts made! No-one clapped when we were there. You wouldn’t have heard them if they had, because it was only 17º F and we were all wearing thermal mittens. 🙂 Great photo of Old Faithful blowing its top. Thanks. Clapping in thermal mittens adds a whole different dimension and makes the waiting a tad more uncomfortable. I have never visited Yellowstone (more’s the pity! 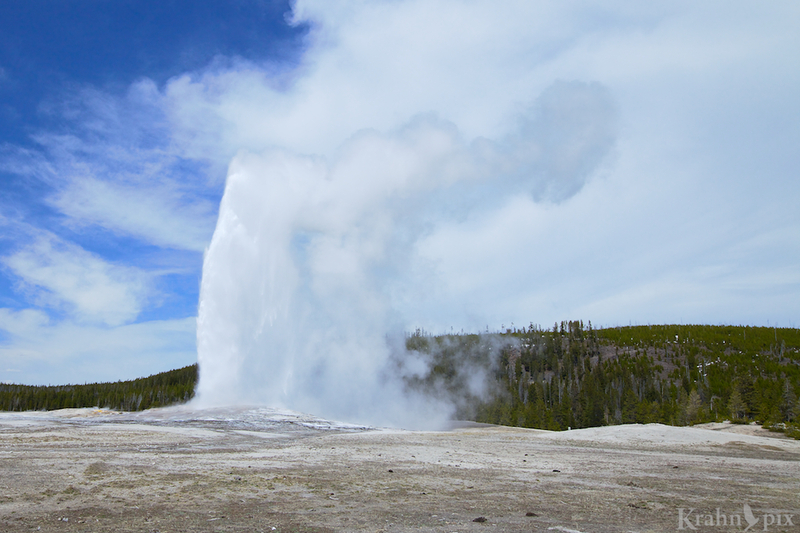 ), but I was fortunate to visit Old Faithful of California (yes! there is one, and if I remember correctly, Yellowstone’s and California’s are two of only three such periodically erupting geysers in the world). It’s funny that people feel the urge to clap at a natural event like that (would you clap at thunder and lightning? a volcanic eruption?). I do remember the peculiar feeling in between eruptions in Calistoga (which supposedly got its name from a drunk person trying to call it the Saratoga of California, only his tongue deceived him and it came out the Calistoga of Sarifornia). There, they have some “fainting goats” to fill in the in-between times. Someone else stole Old Faithful’s name? Unbelievable! Sounds like they had more amusement at the second site with the goats and name pronunciation stories. You raise interesting questions about what other natural events people might be compelled to clap at. I have never been able to quite figure out a pattern to this clapping thing. I talked to a girl yesterday who works at the bar in Yellowstone. They know the geyser is about to go off because the bar is empty, then as soon as it goes off the bar fills with people wanting a drink. Maybe you were the wrong kind of Lemming? Interesting. Apparently this lemming epidemic might be larger than I thot! This needs to go on a tee shirt. “I Am A Lousy Lemming”. I would wear it. It seems to be getting popular!